The motel immortalized in Nina’s memoir sits by the side of one of the busiest highways in North Carolina. 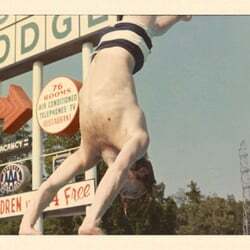 And it used to feature this hairy chested bather by the (no longer extant) pool. There are a lot of things that remind me of Nina. There’s the obvious: pictures, songs, books that belonged to her, movies we enjoyed together, our kids, trips to familiar places, rituals we observed — from the Christmas stockings to the afternoon nap. But some things are more subtly linked to Nina, or more specifically, anyhow. When Nina was being treated at Duke, we made a LOT of trips on I-40/85 en route to Durham. 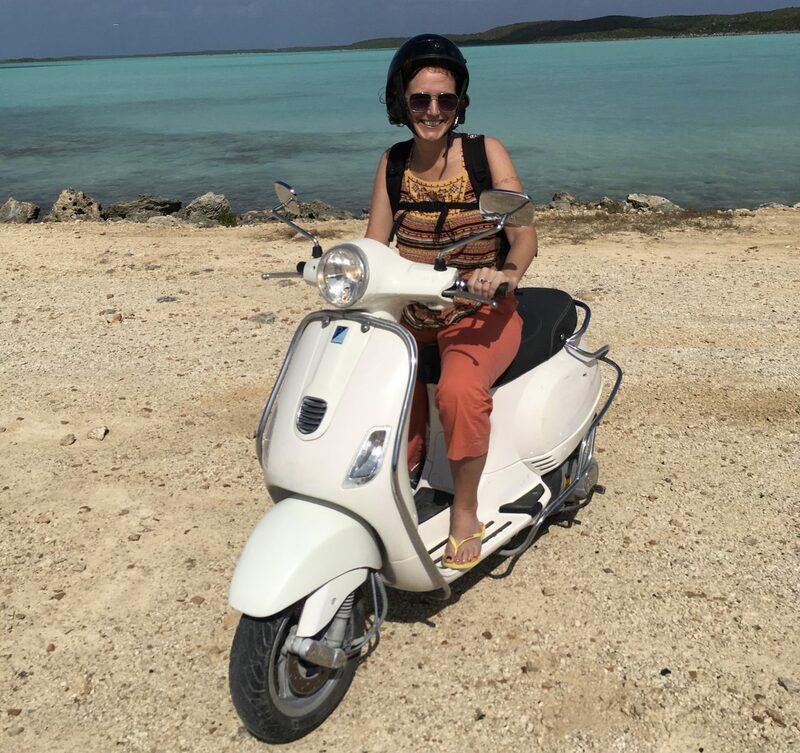 On these trips she started to notice that the same scooter was always outside the Embers Motor Lodge, a shabby roadside motel that’s right behind the (scenic) on-ramp from Hwy 54. At some point she noticed a woman who seemed to belong to the scooter as well. Over months and months of drives to Duke, Nina developed a name and entire persona for the woman — Lyla — which was included in her memoir. Nina took the real-life person — Lyla may or may not have been her real name, but I can verify she was a real person, I saw her — and conjured a literary foil for herself in the throes of her wrestling match with mortality and illness. The fact that Nina did this at a roadside motel in Graham, NC is both completely random and totally appropriate. Alamance County is, well, not much goes on in Alamance County apart from discriminatory policing and VERY minor league baseball. And even in the shallow pool of Alamance County lodging establishments, the Embers Motor Lodge is not the crown jewel. But it is absolutely unavoidable if you are traveling I-40/85, the main East-West artery in the state, with any regularity. You may not craft a whole literary narrative out of it, but just like Nina you’ll see the Embers Motor Lodge, sure as your born. The Embers Motor Lodge that was has passed into oblivion, like so many things in Alamance County. As if to perfect the literary device, or maybe add an unfortunate amount of preciosity to it, depending on your view of neat endings, the universe maintained the real life Lyla storyline only as long as the narrative thread of Nina’s life held taut. I drive 40/85 constantly even without a spouse in treatment at Duke for my work. The next time I went East after Nina died there was no scooter. Soon after, there were work and utility trucks in the parking lot and someone was storing sheds in the grass obscuring the view from the road, making it hard to discern while passing what was going on at Embers. 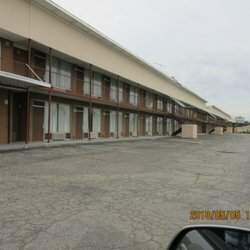 When the sheds cleared, the motel had been redone (touched up might be more accurate, it’s still the Embers Motor Lodge) and there were no further scooter sightings, no further evidence of Lyla at all. The façade of the motel had been outfitted with pillars around the entrance, and the drab brick had even been completely whitewashed, a very literal effacement of Nina’s completely figurative use of the setting and its occupants in her book. There aren’t a lot of pictures of the Embers Motor Lodge online, surprisingly, and this one is pretty pixelated, but it shows the stately new facade nicely. I don’t believe in magic. I don’t see any connection stronger than the emotional and literary. So please don’t @ me, people, with your metaphysical gobbledygook. Blech. I am an impermeable rock of querulous, sciency, agnosticism. But I do sometimes wonder if Nina’s book somehow found its way to Lyla (not judging, but she didn’t look like a reader? ), got fed up with being someone’s literary-device stooge, and was finally motivated to pull her life together and stop living week-to-week at the Embers Motor Lodge. Maybe Lyla wasn’t ruled by fate, but a free-agent, acting in defiance of the Alamance County roadside lot those insufferable, patriarchal gods handed her. Something about this appeals to me beyond the storyline Nina crafted and my attachment to her work. As if somehow Lyla may have taken on the oppressiveness of fate in a way Nina was never able because of cancer, to live in defiance, even if only momentarily in the grand scheme, the finality of all things. Whatever the reason, both the real scene and the trope that Nina summoned from it failed to outlast her. And now every time I pass the 54 exit, instead of a reminder of the thing itself, I see only its absence. Not gonna fade away just yet (but gimme shelter).